I call the work I do self-directed NEUROPLASTICITY change. I train people. I guide them. I point out blind spots. I am their cheer squad and coach. But I am not able to do the work. That is up to them. Only they can do it. So in the course of discussing whether someone is ready for this sort of active approach to change, people will often tell me that they ‘are constantly self-sabotaging them self. Interesting but I don’t believe it. Any one who has worked with me, knows how much importance I place on language and words. So I invite you to challenge the concept of ‘self-sabotage’. It is a concept we have all heard and probably just accepted. So when told about someone’s self-sabotaging tendencies, a psycho-therapeutic question might be ‘Why do you do it?’. They have probably asked themselves the same question and have an answer ready. But that to me is not a useful question because by asking it I am instantly 1) presuming it to be a true statement (which I don’t believe it is) and 2) I am then getting them to guess as to why a non-existant thing exists. The answer may take us down an interesting but potentially harmful path. Is it true that self-sabotage is even a thing? It is clear that some people’s behaviours are contrary to their stated goals or aims, or get in the way of good health or happiness. But is this make it self-sabotage? I don’t think so. This answer is not guess work. This is true. Regardless of whether they self-sabotage or not, believing it makes them feel crappy and weak. That is the reality. They can usually even point to parts of their body that react when they believe that there is a part of them that is actively screwing them over and stopping them from being happy. Imagine believing that there is an evil malicious part of you that is actively undoing any hard work you do. That’s pretty hopeless and puts things out of your control? Who can you blame with this model? No one but yourself. Do you think that view influences how or if they make change? They have two options. Give up trying or battle their evil self. Both daunting options. So in some ways the ‘self-sabotaging myth’ is a self-sabotaging myth. Calling it ‘self-sabotage’ influences one’s ability to change. But something IS definitely happening. I believe a different model is more useful. What I see is not self-sabotage but self-protection. 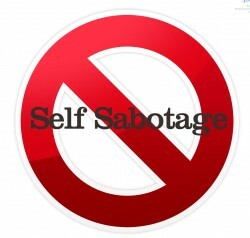 I’ve never yet met a person whose perceived ‘self-sabotage’ isn’t actually self-protection. It’s not broken-ness or weakness. It’s self-protection and therefore something we all have and all need. The self-protective response can be misguided but NEVER evil. The misguided self-protection might be created through limiting understanding of past experience. It might be self-protection driven by fear of failure or fear of success. It might be driven by outdated or limiting beliefs. It might now just be mindlessness. It might be self-protection driven by the belief that not changing is safer and easier than changing. Part of us may want one thing, but another powerful part wants us to be safe. So we do what we need to stay safe and avoid threat. Until this conflict is addressed we will act with consistency and reliability. So this model sees those ‘self-sabotaging’ behaviours in a totally new light. So conflicting parts yes but not evil or malicious. Equally no human EVER lacks motivation. We just might be motivated by different things. So what to do? Be kind and get curious. Often that self-protective part is merely running on inaccurate perceptions of threat or how the world works. The brain learnt something and now believes that it is safer and easier to stay the same. The pain of staying the same outweighs the pain of change. So we protect ourself and stay the same. If we could update that part with the new understandings and different set of behaviours to achieve aims, then we could change without the battle. We are still driven by self-protection. We don’t want that to change but it is expressed in radically different and more appropriate ways. We can then learn to protect ourself with better health, better relationships, better jobs, better behaviours. Think of the stubbornness of ‘self-sabotaging behaviours but directed in fresh ways. Imagine having ‘stubbornly’ healthy behaviours. Instead of getting in our way, they could become an unstoppable force. This way of seeing certain behaviours feels more compassionate and useful. It also means the battle can stop. You don’t need will power. You don’t need to fight yourself. You just need to understand. When this happens people get to ‘inhabit’ a body and mind that isn’t out to screw them over. Instead they have at their disposal, a mind and body that are on their side and working towards a shared aim. It may take curiosity and willingness to look a little deeper. It may take effort but so does the ‘battle’ model. We need a willingness to understand rather than a willingness to fight. Of course it’s just a model. But would you prefer to believe you are intentionally getting in your own way, or accidentally overprotecting yourself because of limiting learnings from the past? The brain is high protective but at times illogical. It’s on your side but at times needs us to step in. Use your brain for a change.